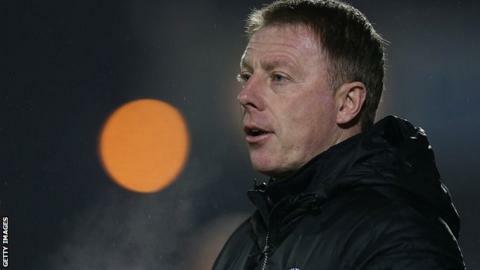 New Hartlepool manager Craig Hignett says the situation at Victoria Park is "positive", despite taking over a side third from bottom in League Two. The ex-Middlesbrough assistant, who held the same post at Hartlepool under Colin Cooper from 2013 to 2014, succeeded Ronnie Moore on Wednesday. Moore parted company with Pools after Tuesday's 2-1 home defeat by Stevenage. "The quality I've seen in training, the intensity and the tempo took me by surprise a bit," Hignett told BBC Tees. "I'm walking into a positive situation. Results and performances haven't been the same, the group of players I've seen today are more than capable of beating teams in this league." Former Tranmere and Rotherham boss Moore helped retain Hartlepool's Football League status last term after his appointment in December 2014. However despite a run of four straight wins at the start of the campaign, form tailed off and Hignett will go into Saturday's home game against Yeovil looking for a first win in five with his side four points above the relegation zone. "First and foremost we need to get away from where we are," he added. "I need to get my message across to the team quickly because there will be a change in style." Craig Hignett has cited the open, jovial methods of Jurgen Klopp as he takes on the Pools job. Liverpudlian Hignett is a self-confessed relaxed and jovial character, but says that will have no impact on his performance with reference to Liverpool boss Jurgen Klopp. "Tell Jurgen Klopp that [you have to be serious], there's a time to be serious and a time where you don't have to be," he added. "I do like a laugh and a joke, but when I'm serious I'm serious, there's a time and a place. "Training we have to be serious, match-day ultra serious, but after the game - win lose or draw - I'll be me. "If I want to have a laugh and joke afterwards, as long as the result isn't too bad then I will." Since Hignett's last stint on the Pools' touchline, the club has been taken over by JPNG - led by chairman Gary Coxall - from Ken Hodcroft and IOR Limited. "I was really impressed by what he [Coxall] had to say," Hignett added. "What he wants to do with the club in the future, how he wants to grow the club, his vision, he wanted a clear identity for it - everything I'd want to bring to a football club. "For me it was the perfect fit."